I guess I really never thought much about this until this morning. 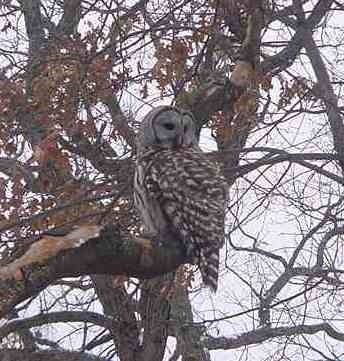 We have a lot of owls around our property, which I think is good. However, this morning I noticed a very large Barred Owl, I’d say about 18 inches or so in height, sitting on a wing of a fountain fairy (spouts water into our pond when temps are not freezing) looking for something. I went to take a photo and it flew into a nearby tree, still keeping an eye on something. That something turned out to be a small squirrel. *This* is the part that I really hadn’t thought much about before, the squirrel was about to become a part of the owl’s diet. We also have a lot of squirrels (who doesn’t) around the pond and have a bird feeder too which attracts them. No birds were in sight due to the owl’s presence. It just never really occurred to me that owls eat squirrels too. Mice and other small rodents, but it never clicked that if the owl was of a larger variety it also gnaws on a little larger animals like fox, Opossums, and squirrels. We hear them in the night hooting away outside, I love listening to them, don’t see them then though. I have never really seen them hunt in the daylight, actually I thought they reserved that behavior for the evening hours. Guess it all depends on how hungry they are, this one was definitely hunting in the day. I was then looking for the movie camera and caught a tiny bit of footage of the owl sitting in the tree looking around, but suddenly he took off. I missed it with the camera of course, it all happened to fast, so I am unclear whether the owl actually ended up with the squirrel or not. Not a very smart little squirrel to be the only creature at the pond with a big owl looming over head, I must say. The owl suddenly swooped out of the view finder and then both owl and squirrel were gone. Warm…well considering (28 degrees) how the weather goes in MN this time of year, a lot of times it is the most exciting thing going on. When it gets around this temp snow is never far away and stands to reason it has found its way into the forecast for the next few days. Quite a bit of it melted in the last couple of weeks with our warm spells and all. On the other hand the water that has formed from the melting snow is now a crunchy ice pack and makes for a poor running environment for my greyhounds who often feel the need for speed. Needless to say they have suffered some minor nicks when making the rounds. Two of my hounds have real issues with boots, another one is a total spaz when you put boots on him. I have several pair of expensive boots in their closet that I’d love to put on them when they go outside during times when the terrain is rough for paws. I gave it up when we were outside one day and one of them threw one boot, had the others loosened…and was just generally not happy with the situation. Still I was determined these guys were wearing their nice boots! I bent over to put this one hound’s (okay…it was Blew!) boots on right and just as I was getting the last one on he decided to bolt. My glasses went one way, I flew another…I think it would be safe to say ‘I had my bell rung’ big time. When I found my glasses, I noted that now Blew was running around with two boots on right, one missing and the other ‘tread’ side up. Renner only had one boot on. Blew was standing on a patch of ice doing his best ‘Bambi’ impression (if you have seen that movie, where Bambi first stands on ice). Renner was running around on three legs because he still had a boot attacking one foot! Yeah….gave up on the boots after that. Now, days when the terrain is ultra rough just becomes a ‘no run’ day.